Paul Theroux has 1 media appearance. 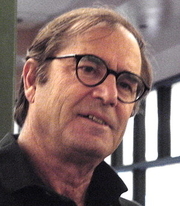 Paul Theroux discusses Dark Star Safari: Overland from Cairo to Capetown. The SAN FRANCISCO TRAVEL BOOK CLUB and LECTURE SERIES will discuss The Great Railway Bazaar: By Train Through Asia by Paul Theroux. The MOSTLY FICTION BOOK CLUB GROUP will discuss The Last Train to Zona Verde: My Ultimate African Safari by Paul Theroux. Paul Theroux , Ghost Train to the Eastern Star: On the Tracks of the Great Railway Bazaar. Paul Theroux discusses Ghost Train to the Eastern Star: On the Tracks of the Great Railway Bazaar. Paul Theroux is currently considered a "single author." If one or more works are by a distinct, homonymous authors, go ahead and split the author. Paul Theroux is composed of 8 names. You can examine and separate out names.